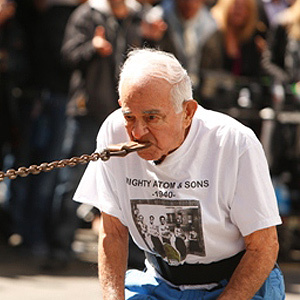 A recent episode of “America’s Got Talent” featured an engaging 93-year-old strongman called The Mighty Atom Jr. The mature muscleman’s stunt: moving a full-sized car (laden with his octogenarian “kid brother,” his brother’s wife, plus Atom’s “lady friend”) using just his teeth. Grinning for host Howie Mandel, Atom proudly told the TV audience that his teeth were all his own; then he grasped a leather strap in his mouth, and successfully pulled the car from a standstill. We’re pleased to see that the Atom has kept his natural teeth in good shape: He must have found time for brushing and flossing in between stunts. Needless to say, his “talent” isn’t one we’d recommend trying at home. But aside from pulling vehicles, teeth can also be chipped or fractured by more mundane (yet still risky) activities — playing sports, nibbling on pencils, or biting too hard on ice. What can you do if that happens to your teeth? Fortunately, we have a number of ways to repair cracked or chipped teeth. One of the easiest and fastest is cosmetic bonding with tooth-colored resins. Bonding can be used to fill in small chips, cracks and discolorations in the teeth. The bonding material is a high-tech mixture of plastic and glass components that’s extremely lifelike, and can last for several years. Plus, it’s a procedure that can be done right in the office, with minimal preparation or discomfort. However, it may not be suitable for larger chips, and it isn’t the longest-lasting type of restoration. When more of the tooth structure is missing, a crown (or cap) might be needed to restore the tooth’s appearance and function. This involves creating a replacement for the entire visible part of the tooth in a dental lab — or in some cases, right in the office. It typically involves making a model of the damaged tooth and its neighbors, then fabricating a replica, which will fit perfectly into the bite. Finally, the replacement crown is permanently cemented to the damaged tooth. A crown replacement can last for many years if the tooth’s roots are in good shape. But what if the roots have been dislodged? In some cases it’s possible to re-implant a tooth that has been knocked out — especially if it has been carefully preserved, and receives immediate professional attention. But if a tooth can’t be saved (due to a deeply fractured root, for example) a dental implant offers today’s best option for tooth replacement. This procedure has a success rate of over 95 percent, and gives you a natural looking replacement tooth that can last for the rest of your life. So what have we learned? If you take care of your teeth, like strongman Atom, they can last a long time — but if you need to move your car, go get the keys.